Where can you find information about them and when do they spawn? Level 71+ (due to Deepfathom level restrictions) may wish to obtain the Title. There are now two ways to obtain a title. 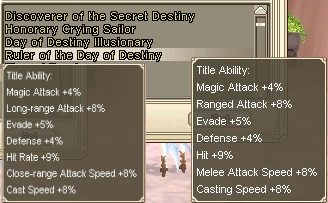 These are two different titles, but they both have the same stats. 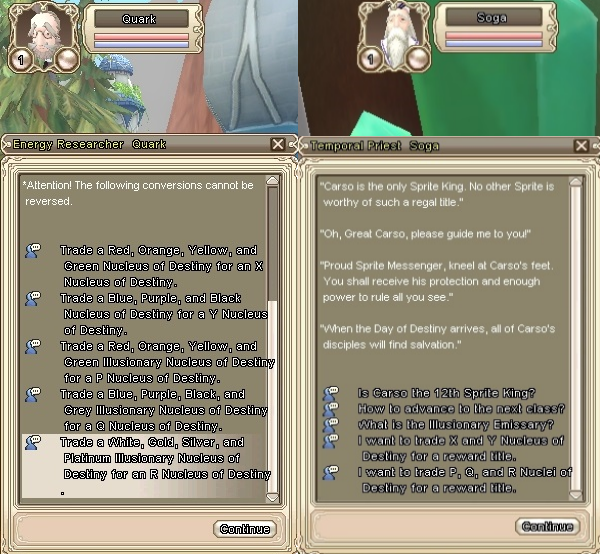 Please note that there was originally an Event during May/June of 2012, with Emissaries for "Ruler of the Day of Destiny" title, and these emissaries are now available once more. For returning players who may still have the "old" versions of the nuclei, NPC Quanta, Aurawhisp Hamlet 215, 297 can exchange the old versions to the new version for you. In order to obtain the "Ruler of the Day of Destiny" title for level 71+ characters, one of each of 7 nuclei must be collected. Every Thursday, at 1pm EST, there will be a special Chimera Event, where a series of bosses will be spawned. If those bosses are successfully slain, then one Chimera will spawn. Please note that the Chimera listed below are in order of #1-7, (with #1 being <Time Traveler> Falcis with Crimson and #7 being <Time Traveler> Deanno with Onyx.) 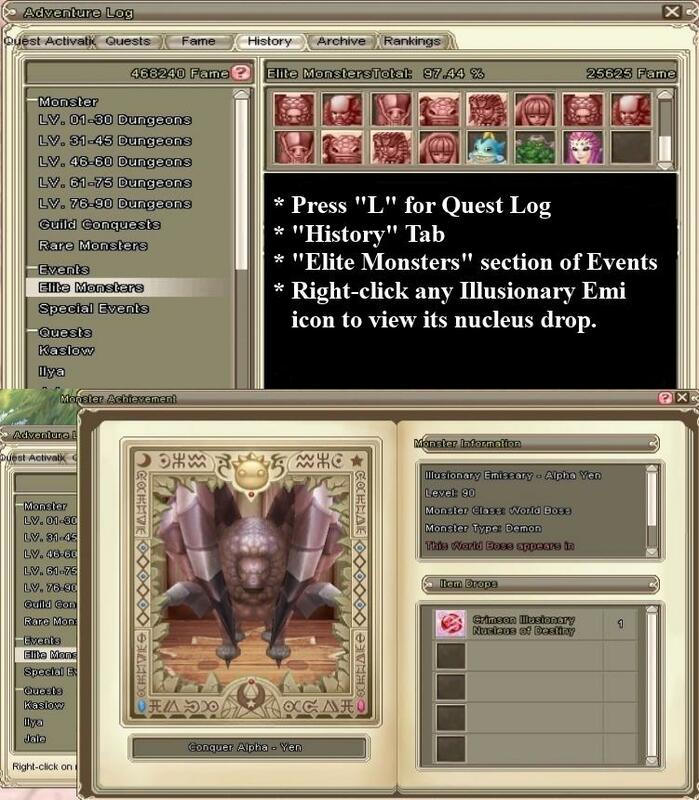 You can find which # Chimera will spawn each week by checking the Events Calendar. This event will only take place on Channel 1, in Spirit Valley, @ 181, 314. Unlike Illusionary Emissary Nuclei, the Destiny ones are stackable and may be exchanged at NPC Quark in Aurawhisp Hamlet @ 215, 297, for the X and Y nuclei. The X and Y nuclei can then be exchanged with NPC Soga in Aurawhisp Hamelt @ 99, 445 for the "Ruler of the Day of Destiny" title. 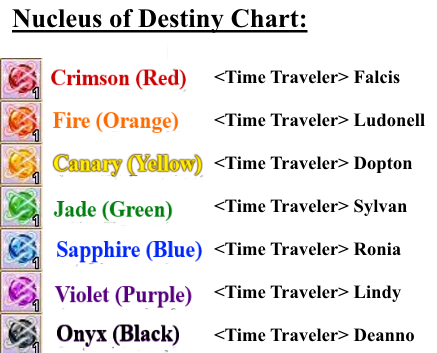 In order to obtain the "Day of Destiny Illusionary" title for level 71+ characters, one of each of the 12 nuclei must be collected. How do you exchange the nuclei for the Title? Please note the times listed are in EST. 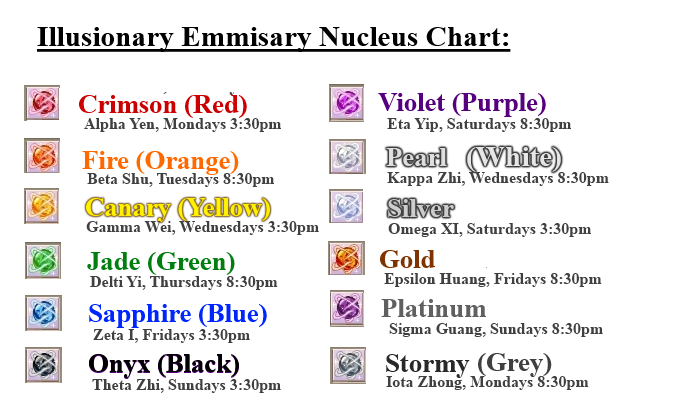 First, you must obtain one of each of the twelve different colors shown above. Please note that days and times of each Emissary may be found here. After collecting your 12 nuclei, Visit NPC Quark in Aurawhisp Hamlet, @ 215, 297. Make sure you have room in your backpack, unlike the regular nuclei, these ones do not stack and must be in your backpack. Select option "I want to trade P, Q & R Nuclei of Destiny for a reward title." 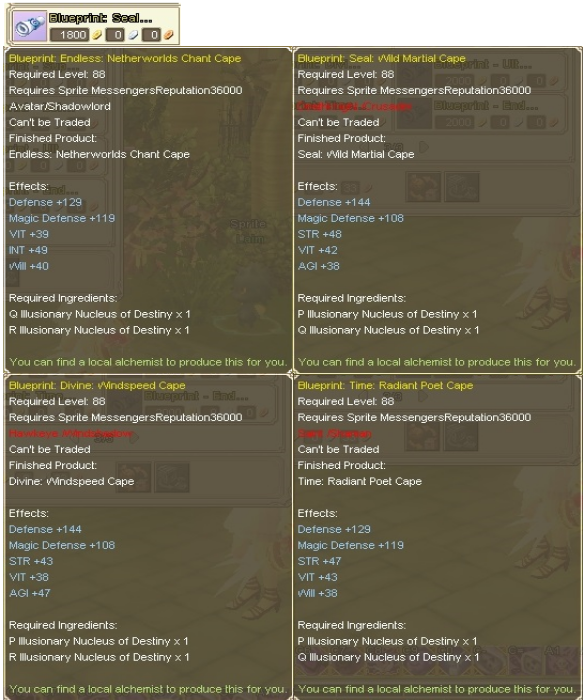 Open Basic Blueprint Shop and turn to page 3. 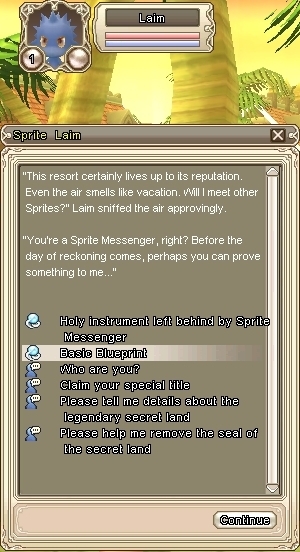 To craft and equip Level 88 Yellow Capes, you must have 36k Sprite Messenger Fame. The blueprint cost is 1800g. See below for which nuclei are needed for each cape.